This lovely Shanore Irish Jewelry pendant, with its iconic Celtic Trinity Knot design, is crafted out of sterling silver and embellished with Swarovski® crystals for superior sparkle and style. This lovely Shanore Irish Jewelry pendant, with its iconic Celtic Trinity Knot design, is crafted out of sterling silver and embellished with Swarovski® crystals for superior sparkle and style. Includes 18-inch sterling silver chain. The instantly recognizable Trinity Knot is a famous symbol used throughout Celtic art and history, and has been since around the 7th Century. Trinity Knots have been found on everything from historical works of art such as at the Book of Kells, to ancient drawings and carvings, representing both pagan and religious beliefs. 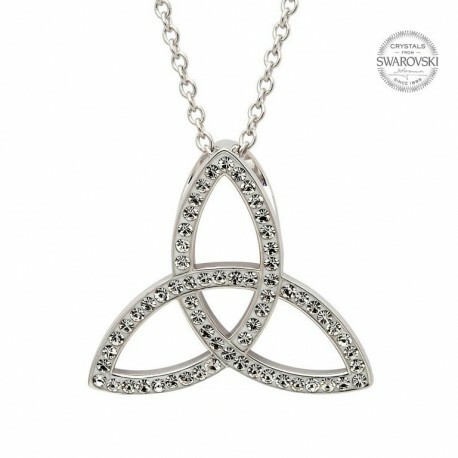 It is also known as the Triquetra, which in Latin means 'three cornered', referring to its unique shape, which is made up of three vesicae piscis, the almond shape made from two perfectly intersecting circles. The perfect compliment to any attire, this radiant necklace will look as stylish with your casual everyday wear as it will with a dressier sweater for a dinner out. The crystals from Swarovski give this classic Celtic icon the right amount shine, giving a hint of elegance as you proclaim your Celtic heritage connection or appreciation for the traditions and artwork of the culture.